Forecast radar for 8am Sunday. 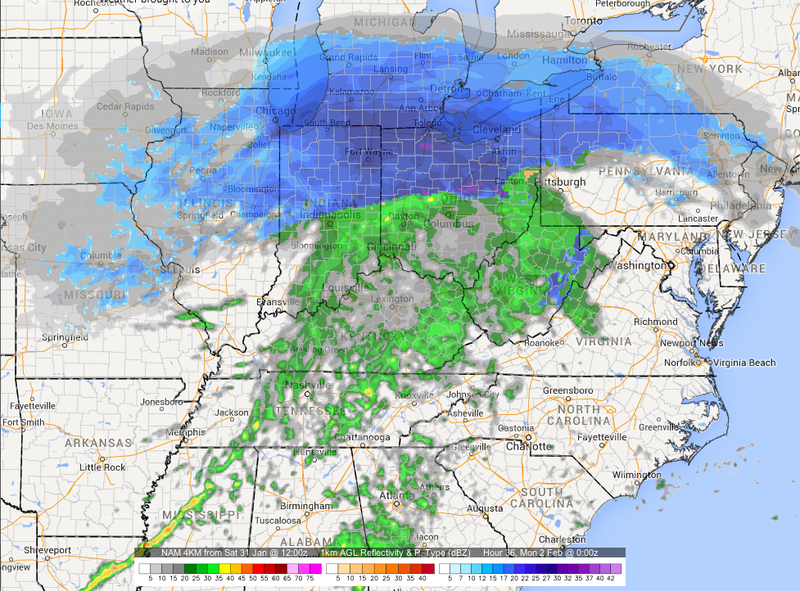 After 9am, snowfall rates should rapidly increase in the Midwest with road conditions between Chicago and Cleveland on Interstate 80 deteriorating very rapidly due to heavy falling snow, poor visibility and increasing winds. 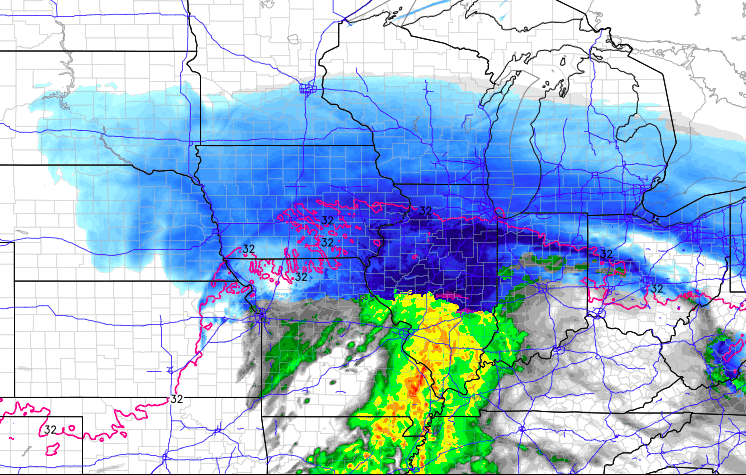 This conditions will also exist through northern Indiana (I-64 north of Lafayette will have poor conditions, also). Last update of the evening. Here is the developing storm as shown by AccuWeather Regional Radar at 5:37pm. It is just getting warmed up. 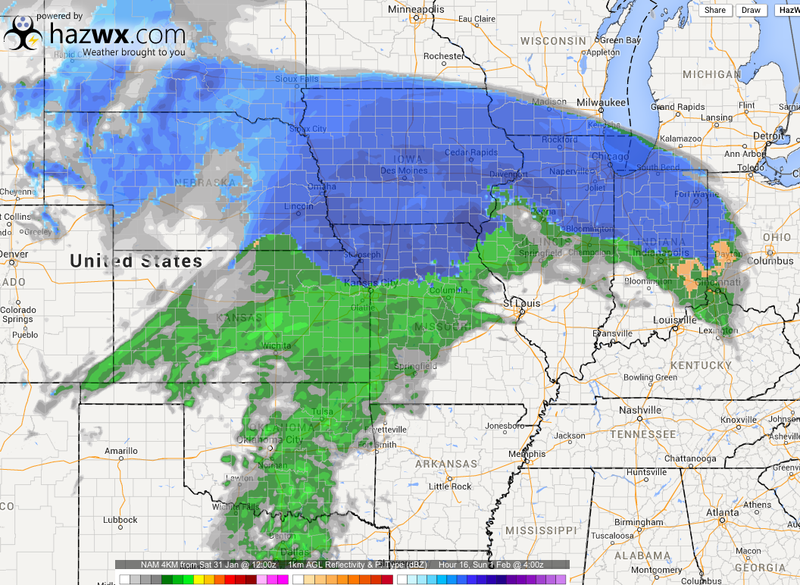 Our model shows heavy snow in a large area during the next 24 hours. 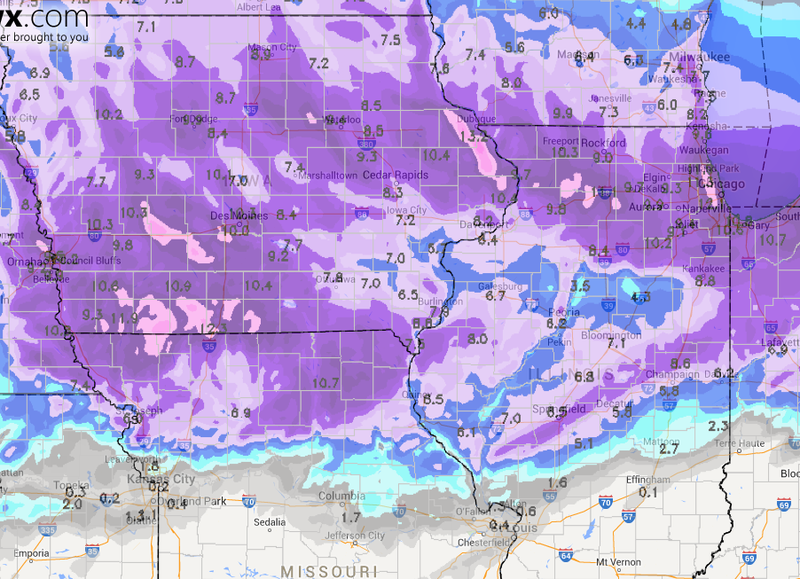 You might wonder why it is forecasting less snow from south of the Quad Cities to east of Peoria and then down toward Quincy. The reason is the model believes there will be some mixed sleet. 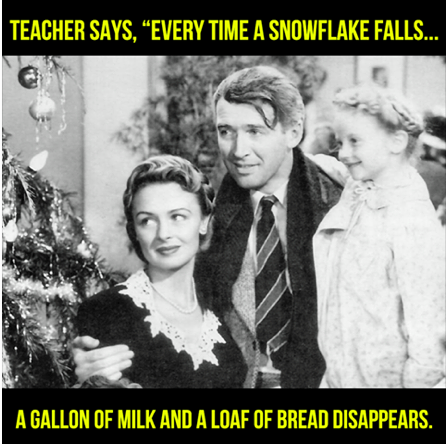 When this occurs, snowfalls rapidly decreases. If the sleet does not occur amounts will be around 9 to 10". Keep in mind that snow accumulation forecasts are generally accurate to within ±25 miles. I'm switching to a second depiction farther east. The area in orange calls for high travel danger due to wind gusts to 25 mph and very heavy rates of snow tomorrow and tomorrow evening. There is a real chance of getting stuck. Finally, the region from the Pennsylvania Turnpike toward NYC and Long Island may have light freezing rain. This probably will not be enough to cause power failures but may cause very hazardous driving conditions. Please note that, as a result, I am not forecasting large snow accumulations in the immediate NYC area. 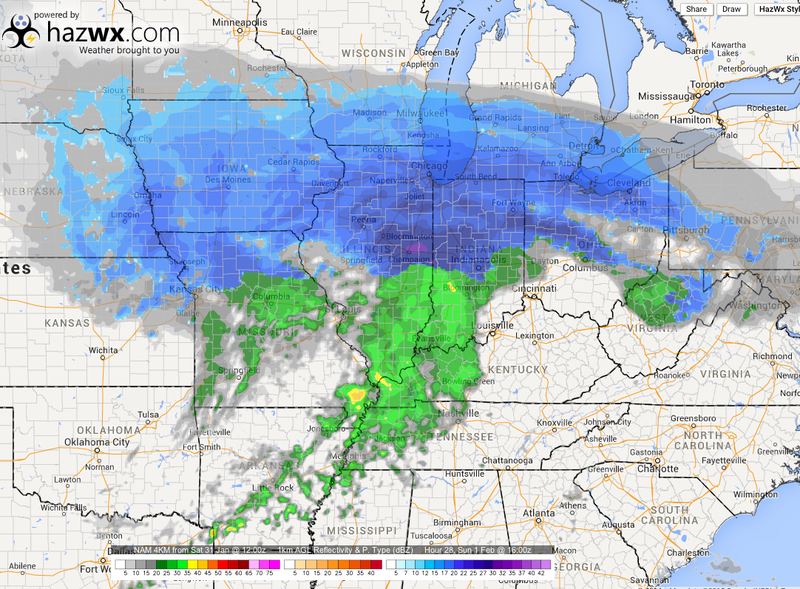 That said, if the system shifts 25 mi. 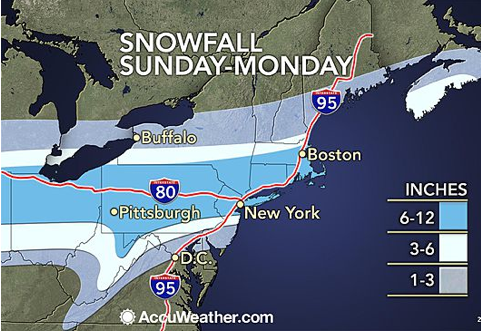 south (see above), NYC could receive an extra 5-6 inches. However, that appears to be the less likely scenario. 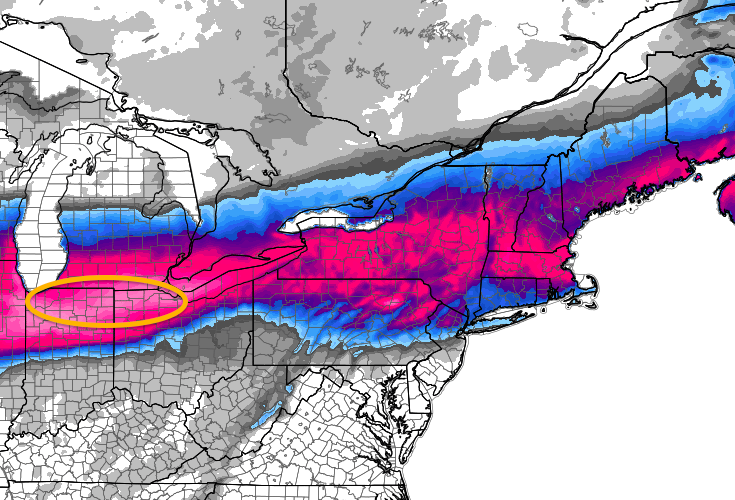 While this storm is not getting the publicity of the blizzard earlier this week, it is going to be a major storm. 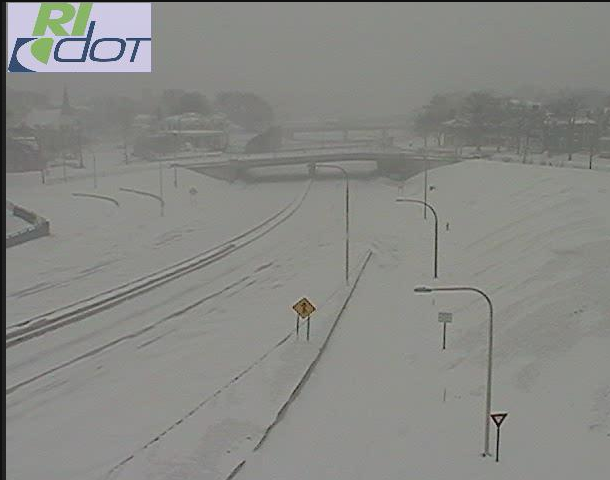 It may especially cause problems in Boston, Springfield, Islip, and other areas that received very heavy snow earlier this week. Because so many people are making plans, let me give you an outline of the timing of this storm. I'll have snow amount forecast later this afternoon. 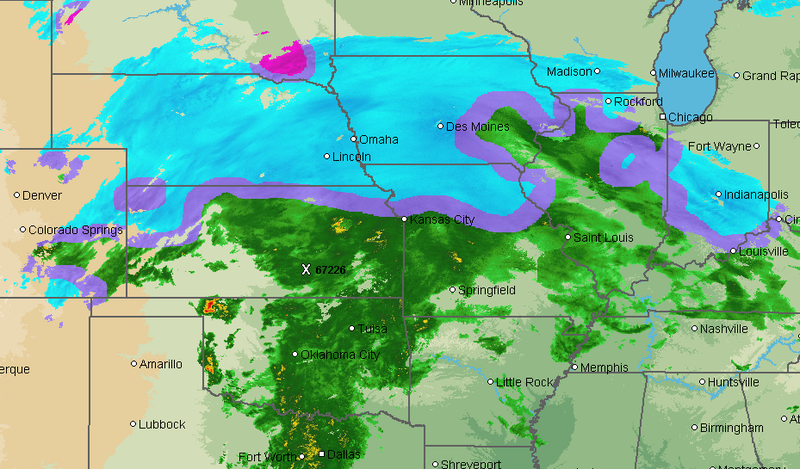 I am working on an updated forecast pertaining to the snow storm now developing over the Plains and forecast to move to the Northeast (scroll down to see earlier forecast). Now, we know these forecast amounts are accurate to roughly 25-30 miles, which was true in the blizzard earlier this week. We have the potential for another wide variation situation in the NYC area. That said, I'll get back to working on the forecast. I am very happy to announce that AccuWeather has acquired WeatherBank and Hazardous Notifications, LLC in the past two weeks. WeatherBank is a leader in the field of weather-driving analytics; using weather information and forecasts to make better, and more profitable, business decisions. This is a rapidly growing field as businesses learn that analytics is an essential tool for managing their businesses. Hazardous Notifications has created amazing computer models (yes, they did very well with the blizzard earlier this week) used for precision forecasting of tornadoes, blizzards and extreme weather. We are already working on new products for our clients that take advantage of these capabilities. Unfortunately, with the snow storm pending in the Midwest and Northeast, I don't have time to write more but will when I have a chance. If you are not doing business with AccuWeather, you should be. Just not often enough in recent years. Oh, joy. It is another winter storm. 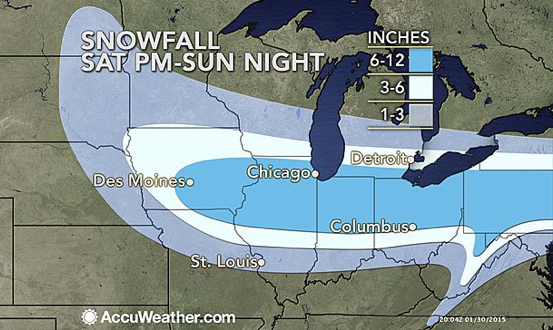 AccuWeather has storm start times and more information. Europe could have saved itself $100 billion by installing solar power panels in sunnier countries and wind turbines in windier places, the World Economic Forum's "Future of Electricity" platform said in a report released on Tuesday. The report, written with consultancy Bain, added that another $40 billion could have been saved by better cross-border coordination and bigger power cables between countries. An ambitious and controversial push to erect America's first offshore wind farm has been dealt what some call a potentially "fatal" blow after two utility companies pulled out of commitments to buy energy from the lagging operation. The $2.6 billion Cape Wind project, a private operation benefiting from millions in federal subsidies, is attempting to pioneer offshore wind energy in pursuit of an eco-friendly, sustainable energy supply. Wind turbines would be installed off the coast of Massachusetts' Cape Cod in Nantucket Sound. But Cape Wind is now in limbo after utility companies terminated huge purchase agreements. They pulled out after the project failed to meet two requirements by Dec. 31: to secure financing and begin construction. There are ways to decarbonize energy that make sense. Here are two. 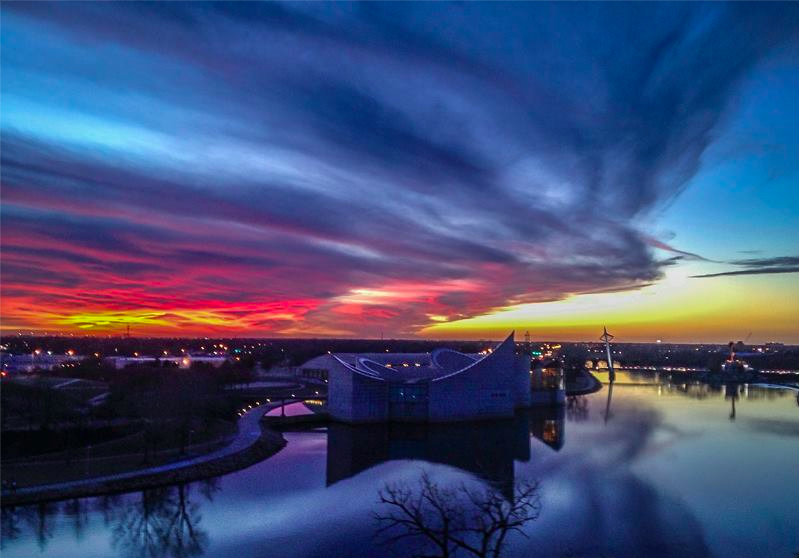 Today is "Kansas Day" -- the 154th anniversary of our state's admittance into the union. 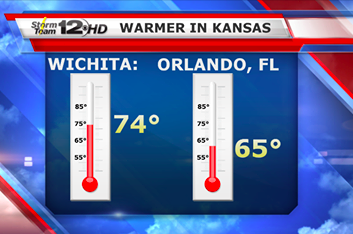 In addition to the terrific people and wonderful, inexpensive lifestyle, it is a meteorologist's paradise. Happy Birthday, Kansas! With more snow in the forecast for many areas east of the Rockies, let's end the day with a smile! Today is a gorgeous day in Kansas with temperatures expected to be in the 70's this afternoon, not dissimilar to when I took this photo last spring. 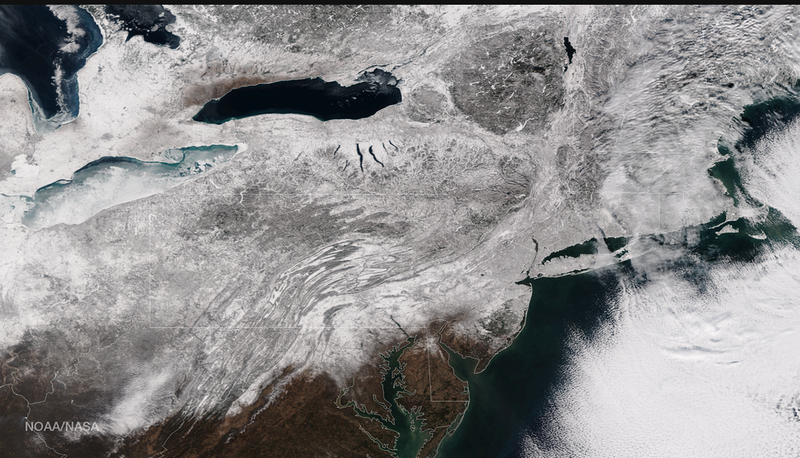 As everyone knows, it has been an entirely different story in the Northeast. 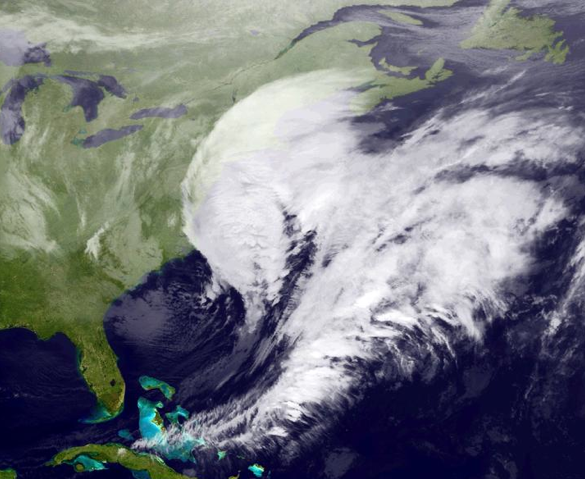 Before the Blizzard of 2015, AccuWeather began reaching out to its railroad and other clients with special messages on Saturday that preparations needed to be made for a major storm. One of those is Norfolk Southern Railroad (at right, BNSF Railway at left). AccuWeather serves 100% of the United States' class one railroads and most of the rest. When we flash the warning that a blizzard is on the way, fuel supplies for "switch heaters" (below) are checked and the heaters readied, snow plows are moved by rail into the affected region and schedules are modified. We often have conference calls with our clients during the storm. AccuWeather invented the "track-specific" storm warnings where precision information, tailored to the railroads' needs is provided on a mile-post-by-milepost basis. Conservative projections show we have saved the industry well over one billion dollars. 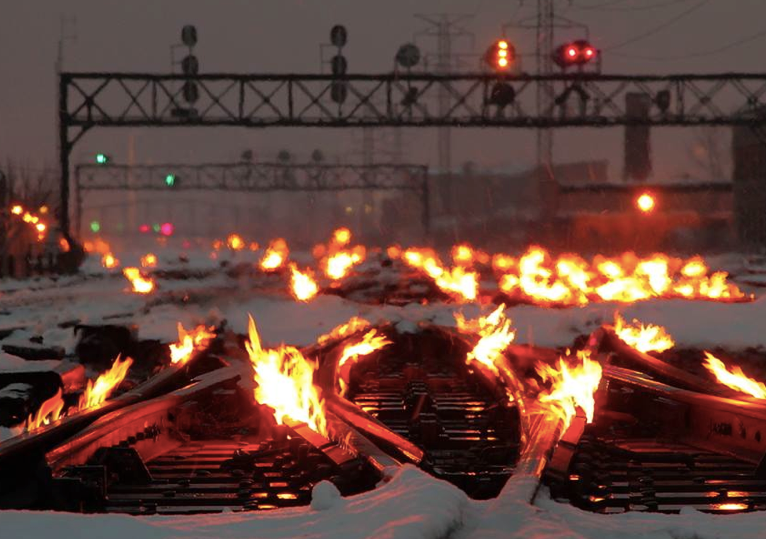 What do the railroads say? John is speaking about their former practice of using much larger government warnings that are not tailored to railroad requirements. ESRI is a GIS mapping company used by both AccuWeather and Norfolk Southern. With ERSI, everything geographic is "apples to apples." 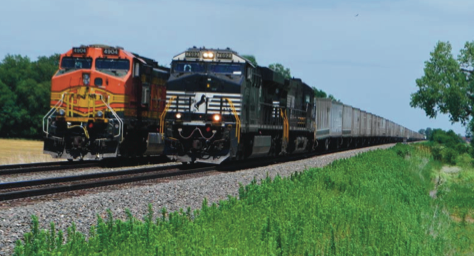 If you would like to learn more about what we do with railroads, go here. To learn more about AccuWeather Enterprise Solutions and how we can help save people, property and profits, go here. A very informative editorial here. Want to Learn How Meteorologists Do What We Do? Philadelphia meteorologist Kate Bilo is commenting that the amount of progress made in storm warnings of all types is "staggering." Warnings: The True Story of How Science Tamed the Weather tells how horrific storms used to kill thousands and how weather science, today, saves the vast majority of those lives. It is written in the form of a novel, not as a science book and has received outstanding reviews by both the critics and reading public. And, yes, I even talk about forecasts that were truly busts and what it is like to be in a meteorologist's shoes when those occur. Once everyone started to calm down this morning, many of my colleagues started proclaiming forecast probabilities are the answer to the Manhattan 'bust.' For the time being, I mildly disagree. The concept is fine, especially for specialized users. The issue is the implementation. 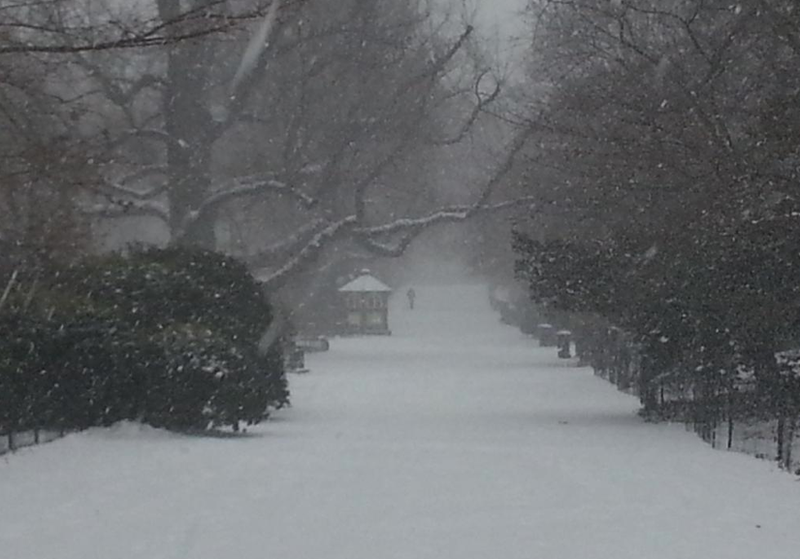 The snow amounts across the NYC Metro area ranged from 7 to 28 inches. 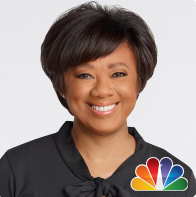 So, let's consider my friend and NYC meteorologist Janice Huff. Keep in mind that objective research demonstrates, over and over, that television is the #1 source of information in critical situations. The probability of 2" of snow at Newark is 80%. The probability of 8 inches is 60%. The probability of 15 inches is 40%. The probability of 20 inches is 20%. 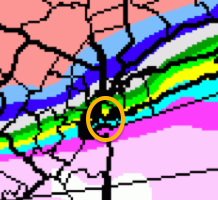 The probability of 2" of snow in mid-town Manhattan is 90%. The probability of 8 inches is 70%. The probability of 15 inches is 50%. The probability of 20 inches is 30%. The probability of 2" of snow in Queens is 90%. The probability of 8 inches is 70%. The probability of 15 inches is 50%. The probability of 20 inches is 30%. The probability of 2" of snow at Islip is 95%. The probability of 8 inches is 80%. The probability of 15 inches is 70%. The probability of 20 inches is 40%. …and on and on and on across the Tri-State area!!! Do you want to watch that weathercast!? I doubt it. Now, with a better range of calibrated forecast tools, better dissemination technology (GPS+GIS, etc.) and a huge education effort, it will likely be possible to make probabilities useful. But, that is not the end of the story. As Chris Matthews said this evening, "The politicians still have to make a decision!" Some of my academic colleagues don't realize that, in the end, a decision has to be made and the decision usually comes down to a yes or a no. So, can probabilities be useful? Yes. But, for the public-at-large, I do not believe they are ready for prime time. I have been a paid forecaster since I was 19-years old (WKY TV, OKC). I turned 63 earlier this month. While I will not claim that 45-years of being a practicing meteorologist has given me any special wisdom, it has certainly given me lots of experience. So, I want to share some thoughts with you. When I awakened this morning and began looking at the storm and the meteorology discussion boards (for snowfall amounts) I was shocked by the amount of self-flagellation going on with regard to the NYC forecast. Over and over, meteorologists were criticizing themselves and their colleagues for getting the Manhattan (only one of the five NYC boroughs) wrong. Let’s hold it a minute! 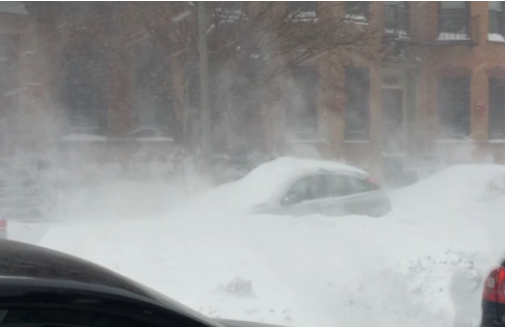 · The reports from Manhattan that I have seen indicate 8-9 inches accumulated. 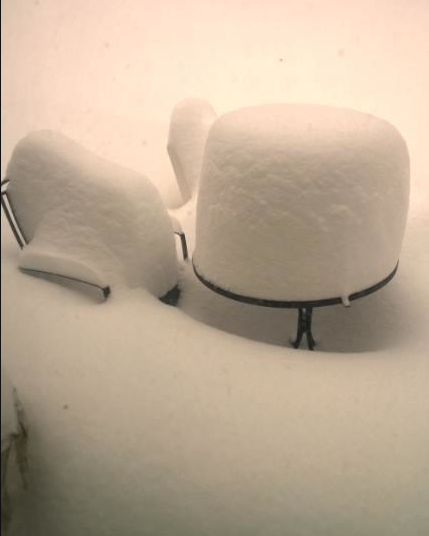 · Far east Queens had 15+inches (still snowing) and Islip, last I saw, had 23” with moderate snow still falling. 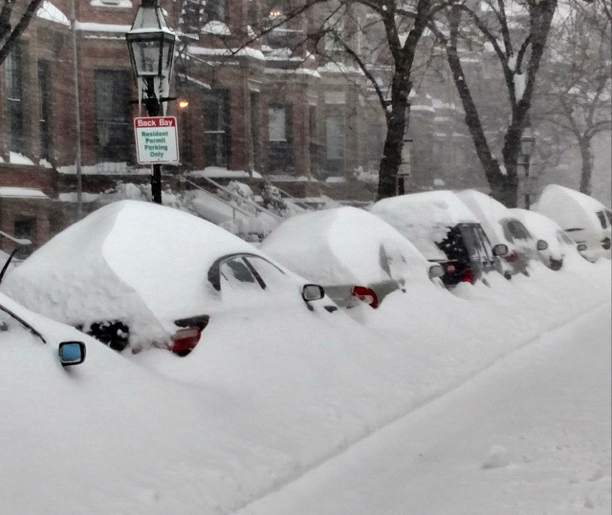 The forecast for Boston, Providence, Worcester, and other areas was nearly perfect. This is the scene at Boston U about 11:30am. A fierce blizzard is in progress. I can tell you story after story of using the barotropic, baroclinic, and LFM models along with “rules of thumb” (Goree and Yonkin, BJ Cooks’, etc.) in the 1970’s through the mid-80s and confidently forecasting “four to eight inches” and waking up the next day to absolutely dry streets and clear skies. We had no idea what a “dry slot” was. 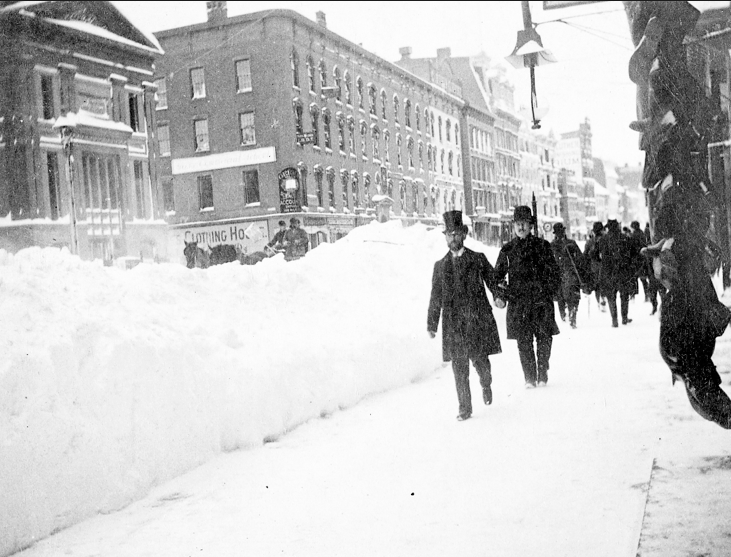 There were also heavy snow storms that went unforecast. What progress we have made! 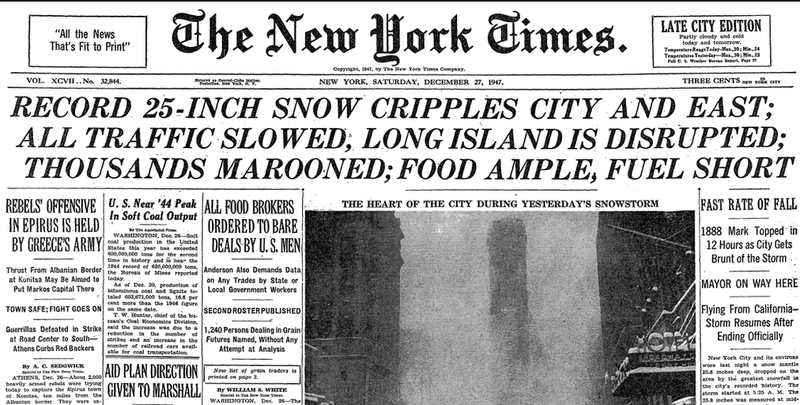 Assume for a moment that Manhattan received 9” of snow that was unforecast. Absolute gridlock would have resulted. With our forecast, sand and salt trucks were loaded, plows were put on dump trucks, etc. School was called in many areas but most districts would have called it for 9” as well as 20” – beyond the threshold for calling school, it didn’t matter. The same can be said from the people who were allowed to work from home. 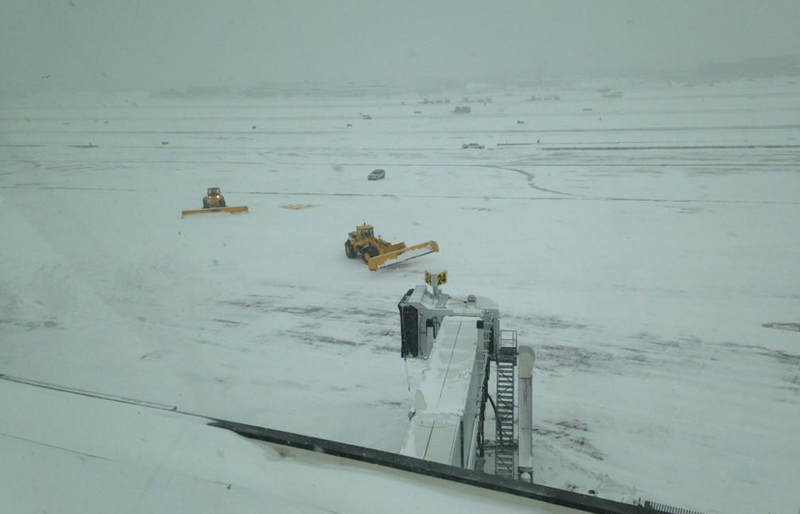 Airlines cancelled flights (perhaps too many) appropriately. Railroads moved snow plows into position and they were needed. They just had to move them a little farther east than originally planned. have been able to conduct operations normally? In other words: Our NYC forecast, while hardly perfect, was useful. There is a wonderful book called The Children’s Blizzard. It tells the story of an unforecast ferocious blizzard that struck as children in Minnesota and the Dakotas were walking home from school. At least 213 died (total fatalities around 500). There is no reason to believe that would not happen again today if a similar storm occurred without any warning. Don’t believe me? Think back to the Joplin tornado. When the NWS warning system failed, society went right back to triple-digit tornado fatalities. There is little doubt in my mind that this forecast for Boston, Providence and so many other areas will, in the end, have saved lives. 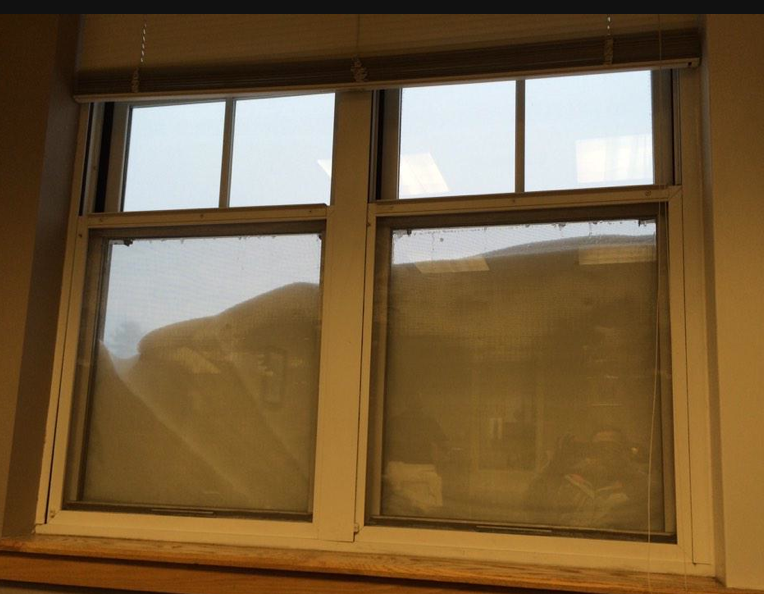 Yes, we want to learn from this storm. But let’s take a moment to congratulate our fellow meteorologists and be proud we get to work in a profession that saves so many lives and does so much good for our nation and the world. Worcester, MA - 25" Islip, NY - 20.9" Killingly, CT - 20" Falmouth, MA - 19" Dracut, MA - 18.1" Plymouth, MA - 15.8"
More than two feet fell on Long Island with severe drifting. The official snow amount at Islip was 21"
The heaviest snow in NYC was in the eastern part of the boroughs and on Long Island. This is what the blizzard looked like on Long Island at 9:35pm. Winds there are gusting to 45 mph. 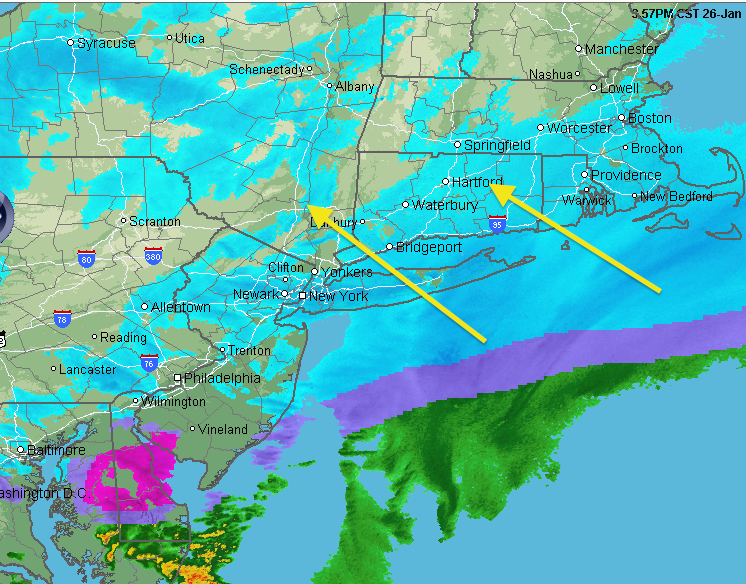 Here is the Long Island radar which snows the snow moving west northwest. 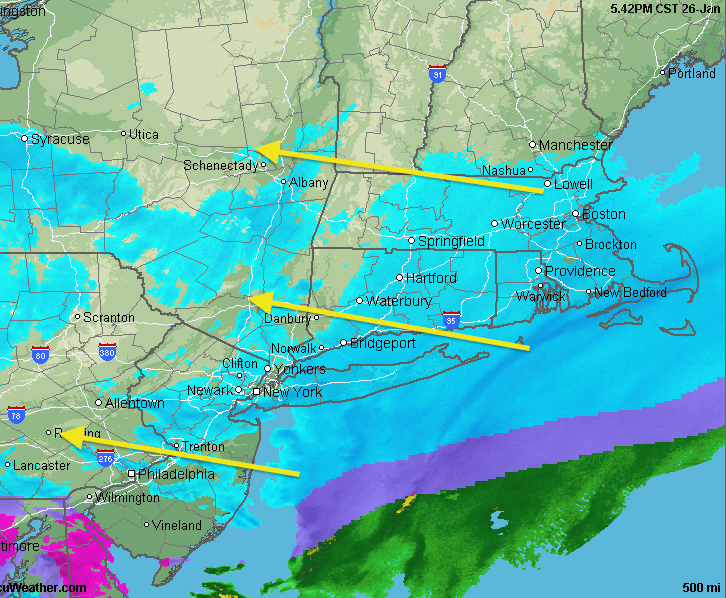 NWS dual-polarization radar confirms the bright yellow is snow at a rate of about 4" per hour. There may be some lightning with it. Still not changing the snow amount forecast. Winds will increase and snow will increase from the Hudson Valley through southeast New England during the night. "…snowfalls are a thing of the past." See the article for yourself, here. 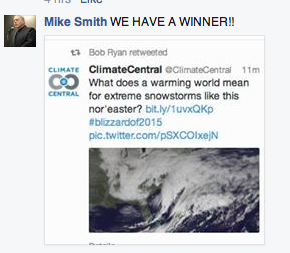 Yesterday, on Facebook, I posted an item asking how long it would take until the climate cult started blaming the Blizzard of 2015 on global warming. We'll get to the science in a moment. But, this whole exercise strikes me as ghoulish. Big Climate can't wait until a huge storm -- that will seriously inconvenience or even kill many people -- to pounce with its propaganda, regardless of whether the science supports their claims. 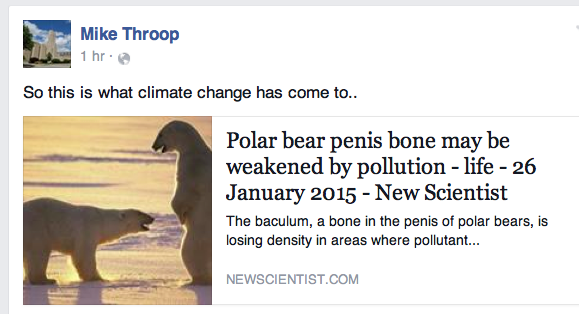 First, the peer-reviewed science does not support these claims. Check here and here, if you wish to read it. There is no upward trend in Northeast blizzards. So, the scientific literature does not support a claim that blizzards are worse or more frequent. And, if severe blizzards occurred before CO2 levels began to rise (late 1950's) how in the world is the current blizzard caused by global warming??!! As previously stated, global warming used to be about science. It is now, almost entirely, about politics and money. 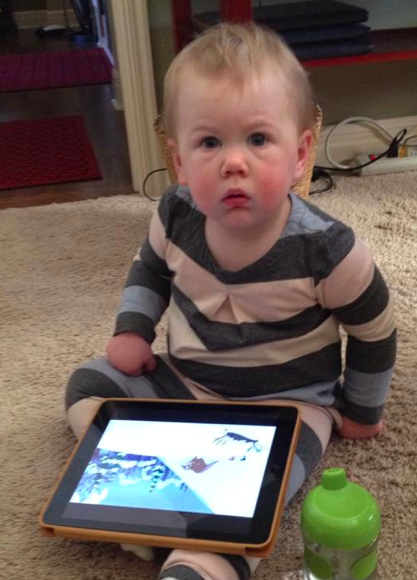 Forecaster Evie: Are You Kidding?? Forecaster Evie and I just saw a television reporter in the Midwest stating, "I'll see you in NYC tomorrow." Evie and I say, "Wanna bet?" There is 5" of snow on the ground in New York City already. Kennedy Airport has reported wind gusts to 37 mph and the winds are just getting started. The satellite (below) shows the low pressure system slightly west (bad!) of where it was predicted to be at this point. Under those clouds are thunderstorms -- more bad news. 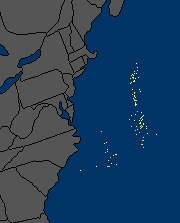 The AccuWeather map below shows cloud-to-ground lighting flashes. Those flashes indicate a strengthening weather system. 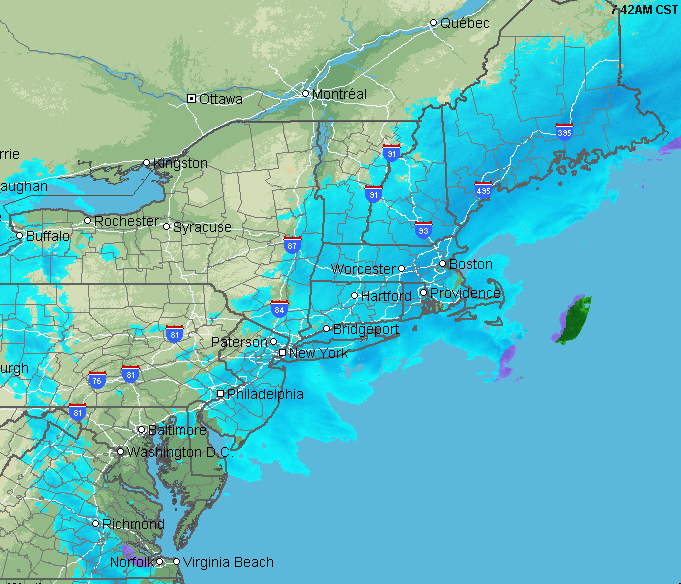 Here is the AccuWeather Regional Radar showing the storm as of 6:15pm As the storm strengthens the movement of the snow is becoming more westerly than on the last update. 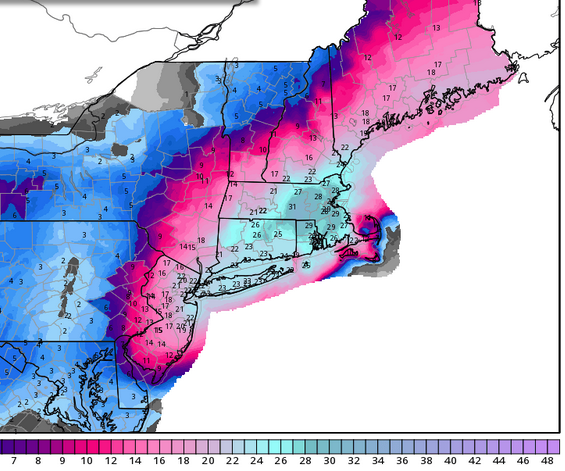 It would not surprise me to see a spot or two on Long Island or southeast New England have between 35 and 40" whipped by blizzard winds. Drifts may exceed 8 ft. in those areas. Otherwise, the forecast snow amounts immediately below still look good. These are the forecast maximum gusts. Very impressive. Power crews are already heading in the direction of the Northeast to restore power. Please be prepared for power failures if you live in one of the high wind areas. 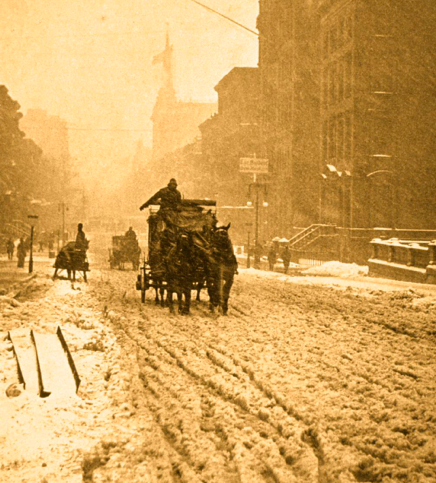 The National Weather Service says "New York City will be a raging blizzard by 6am." I have placed arrows depicting the direction of movement of the snow. Yes, that is rain out over the Atlantic but with the cold temperatures inland the precipitation will stay in the form of snow over land. 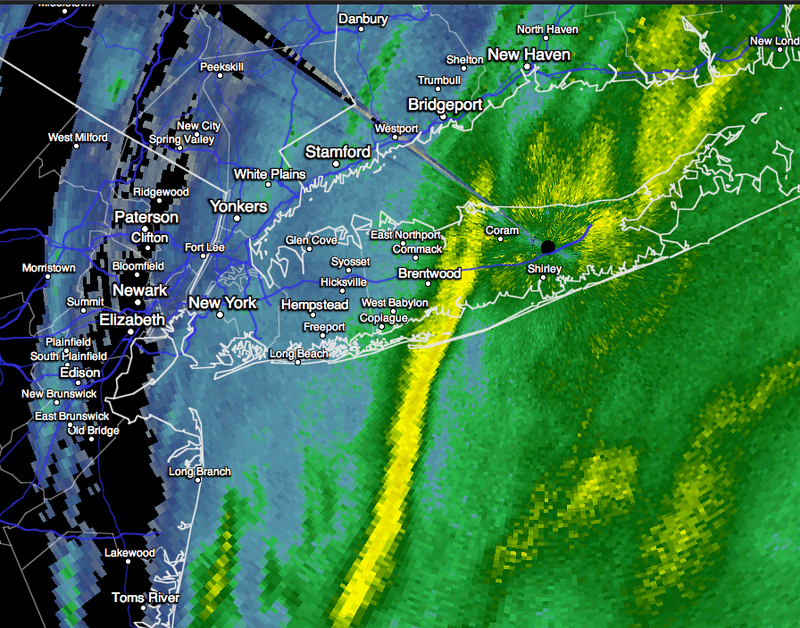 In New York, winds are now picking up with about 4 to 5" already on the ground. 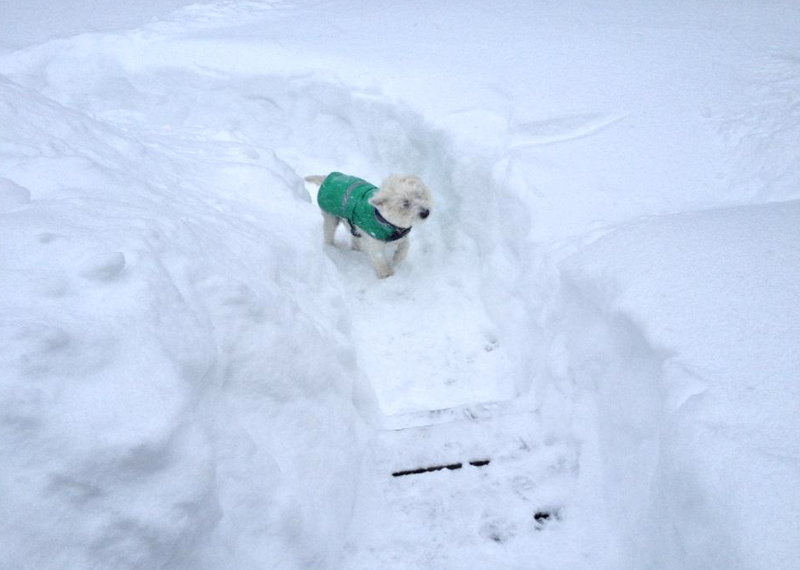 New York will see about 24" with another few inches on Long Island. Subways will be shut down at 11pm. My snow amount forecast is unchanged; it is pretty much what I was forecasting yesterday with the exception of the heavier amounts around Boston. 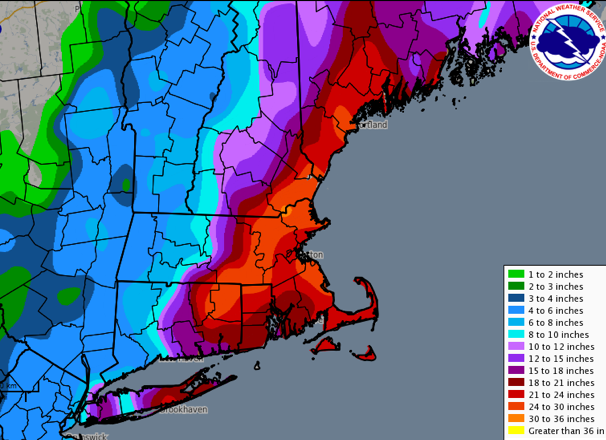 At Logan, I'm thinking about 28-30" however, there will be so much drifting it will be hard to tell. 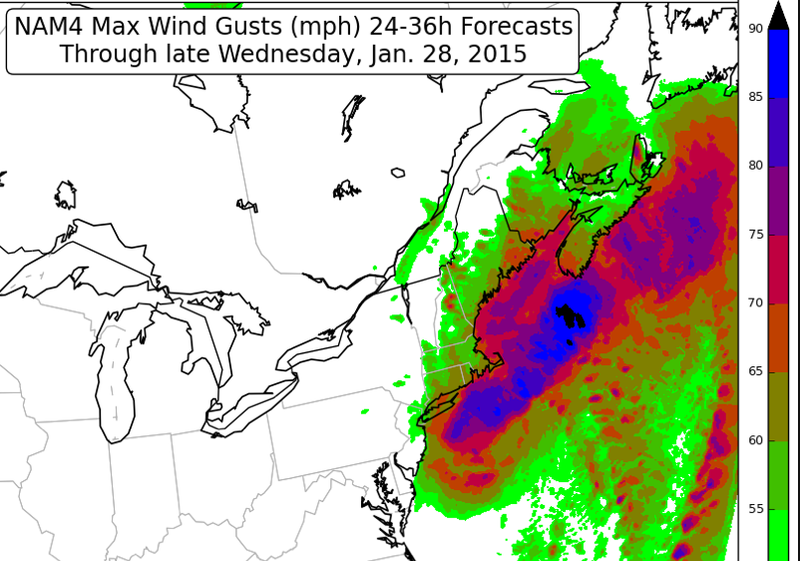 Winds will be increasing across all of coastal New England overnight. 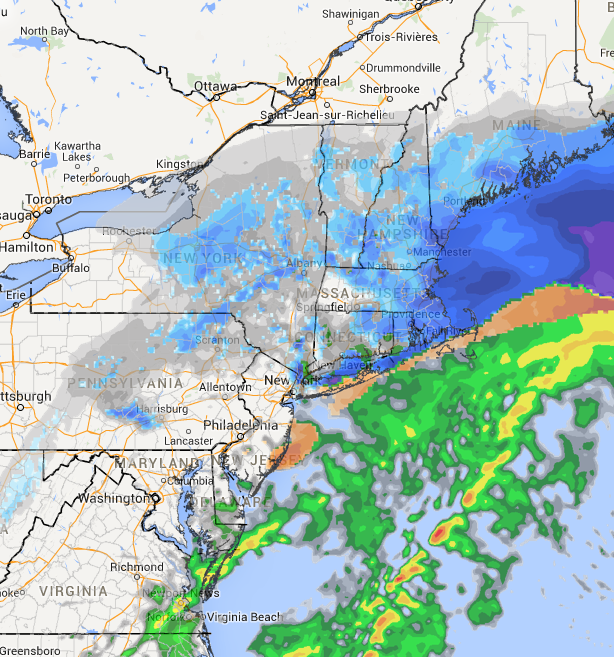 Blizzard conditions will spread across the areas tinted in green and in coastal Maine. So, the blizzard has arrived. Good luck, everyone! I'll have at least one other update this evening. 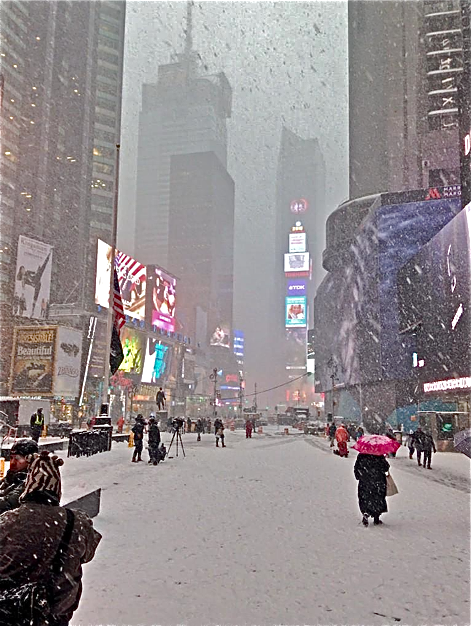 Via Twitter, photo of Times Square from 3:30pm. People walking down Broadway and you can see a TV camera set up. Heavy snow falling. Heavy snow now falling on New York City. Photo below, minutes old, of Central Park. Newark has 4"on the ground. LaGuardia and JFK have 2", each. 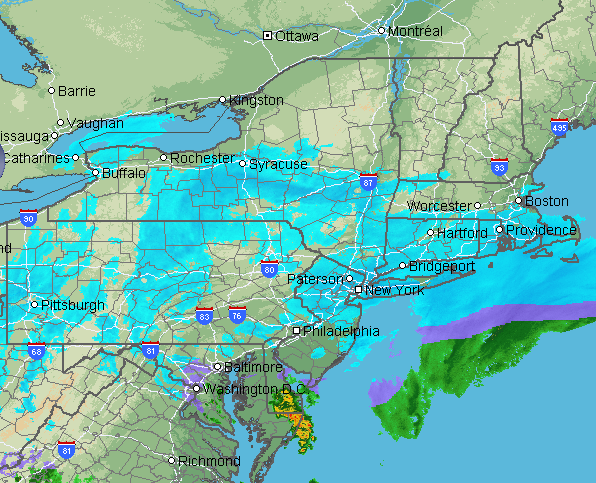 Here is the AccuWeather Regional Radar at 3:30pm EST. Hunker down. Here we go. Al Gore is Going to Sing?? 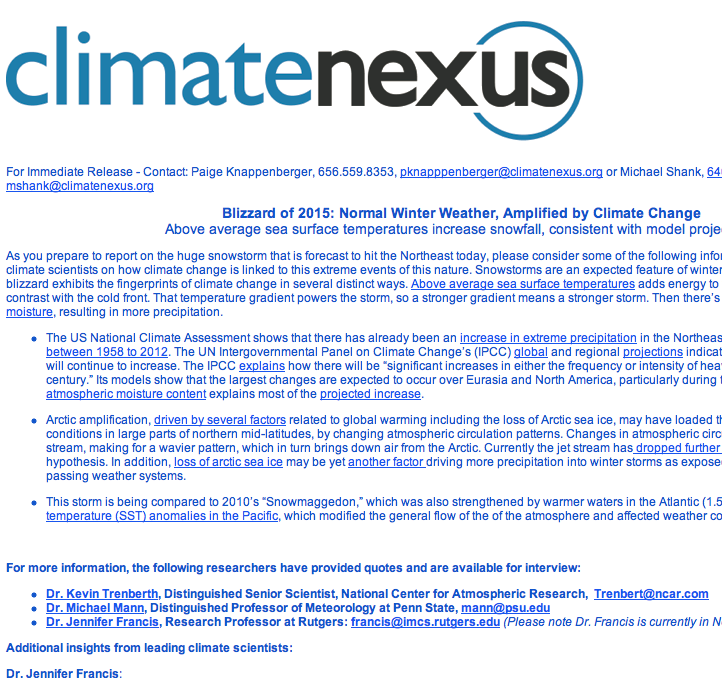 Am I Concerned About the "Warmest Year Ever"? 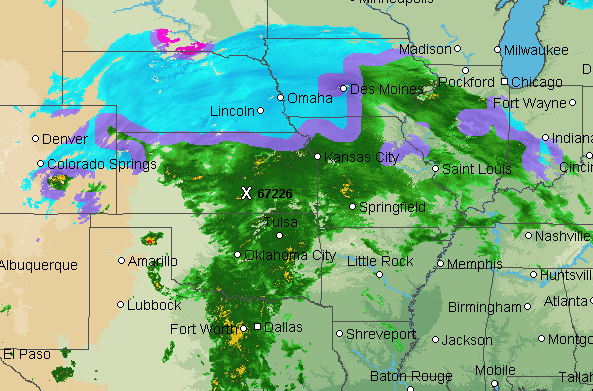 Ice Storm in the Triange?